Growing Apple Trees in Orissa, India? 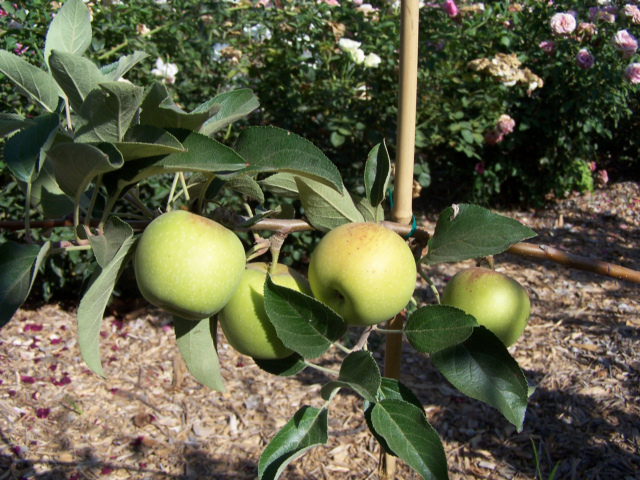 I am interested to grow apple in my native place – Kendujhar, Orissa, India. Can I do that? Apples grow in Mumbai and Bangkok, Thailand, and so yes, they would grow in Kendujhar. Because of the drenching rains they must be planted on raised hills to allow good drainage or the roots will quickly rot. Two varieties available locally you should start with are Anna and Dorsett Golden, which a client was able to find at a local nursery in Mumbai. Granny Smith and Gala are two other ones you might be able to find there in India. There are other varieties that would do very well but importing them into India is not an easy process. In the tropics the apple trees must be trained correctly during growth or they will have long, whippy branches growing with low branch angles right alongside the trunk and be most unproductive. The trunk is notched above selected buds which will cause it to sprout branches there, and as the branch sprouts out the angle is spread with toothpicks until it is large enough to weigh or tie down to be at or below horizontal. This causes it to enter into fruiting mode instead of the vigorous vegetative mode common in the tropics. After six months of growing the leaves are manually stripped off, which causes the tree to think that its dormancy requirement has been satisfied, and it will blossom and set fruit some weeks later. If Joan has no objections I’ll plug my book Growing Apples in the Tropics, which has detailed directions for training and is available at http://www.kuffelcreek.com in the Apples section.